Airbrake has made error tracking easy for us and I enjoy that the interface and feature set continue to improve over the years. Airbrake is one of the items on our checklist to setup with every new webapp we create. The setup is fast and it provides immediate value. Being able to receive an email for a new error that comes in is indispensable. Airbrake is one of the items on our checklist to setup with every new webapp we create. The setup is fast and it provides immediate value. Being able to receive an email for a new error that comes in is indispensable. I would like to see Airbrake integrate with Kanbanery as that is our agile project management tool of choice. It does already integrate with Trello and Pivotal Tracker. Finally, while we use Airbrake on all of our apps, we do not always upgrade to a paid plan as it is simply more than we need. If Airbrake had one more lower tier paid option, then we would consider upgrading more apps to paid plans. We rely on Airbrake for additional production and test environment monitoring of app exceptions. By linking Airbrake error alerts to HipChat notifications, we get great high-level alerts whenever an error happens, right in our team chat room. It's easy to drill down into the error details with the UI. We also use the Comments feature of the Airbrake errors to reduce bystander effect among team members -- no comment means nobody triaged the issue.Great UI, easy to drill into the errors. It's great how they roll up errors of similar types intelligently. The "Occurrences" view is especially helpful, to know which errors are infrequent and which deserve higher attention. Great UI, easy to drill into the errors. It's great how they roll up errors of similar types intelligently. The "Occurrences" view is especially helpful, to know which errors are infrequent and which deserve higher attention. Bots, and plugins, and cache invalidation, oh my! Airbrake has been used by other teams in my organizations for quite some time. My team and I were building a new Rails application and we decided to include Airbrake for error reporting. Using Airbrake was one of the best decisions we made and here's why: tl;dr - Installation, configuration, and integration were all painless. My only request is to expand supported integrations to more and different systems (New Relic, in our case). 1) App integration: "Installing" Airbrake in our Rails application was as simple as adding an entry in our Gemfile and creating an initializer for configuration. And that's it! 2) Configurability: As I just mentioned, configuration is available in your application. However, configuration "points" also exist in Airbrake at the account, project, and user levels. All these configurations work together seamlessly. This has allowed us to get the right notifications to the right people at the right time and avoid the "notification overload" that can come with other monitoring solutions. 3) External Integrations: Airbrake supports integration with many popular issue trackers and team communication solutions. We integrate Airbrake with JIRA and Slack, so there was no need to introduce a new tool to our daily workflow. However, I would like to see integration support expanded. For example, the integration with New Relic requires a third party solution that ended up not working for us. Airbrake does support webhooks, so we're still able to integrate with systems that are not supported OoTB. 4) Documentation: Setting up Airbrake and integrating it into our ecosystem has required little to no guesswork on our part. since we don't have the luxury of time to debug and traceback every issue happening to our multiple sites, airbrake cuts so much time debugging and that time saved is better spent on working on a fix right away, sometimes even before the users notice anything.Our Devs love to sift through the detailed logs, if they put the airbrake code in their source properly. For me as QA, i can also traceback what scenario triggers a particular error log. if we don't have enough time to go inside airbrake, we can have email/slack alerts set up for specific issues, from specified environments. mute an expected alert is also possible, if needed. The dashboard is available with graphs and statistical data. Our Devs love to sift through the detailed logs, if they put the airbrake code in their source properly. For me as QA, i can also traceback what scenario triggers a particular error log. if we don't have enough time to go inside airbrake, we can have email/slack alerts set up for specific issues, from specified environments. mute an expected alert is also possible, if needed. The dashboard is available with graphs and statistical data. probably too much information at times, like for a simple error message on the UI, there maybe hundreds of lines of backtrace info being sent. maybe not a very bad thing to have, but when the issues come in all at once, it's overwhelming that the users don't want to be inside the airbrake site anymore and just wait for user feedback, then check airbrake as last resort. Small - $39 per month for 5 applications and 10 users. Pro - $89 per month for 15 applications and 20 users. Enterprise - $199 per month for 40 applications and 30 users. Complete stack trace, context and metadata enables users to determine exactly where the error occurred. Error charts show error trends over time, when application and bug fixes were deployed, and any instances where the number of errors exceeded the rate limit for reporting. Deploy tracking reveals which bugs were fixed and any new bugs launched. Custom alerts and notifications give users control over who sees which errors, when and how. Below are some frequently asked questions for Airbrake. Q. What type of pricing plans does Airbrake offer? Q. Who are the typical users of Airbrake? Q. What languages does Airbrake support? Q. Does Airbrake support mobile devices? Q. Does Airbrake offer an API? No, Airbrake does not have an API available. Q. What other apps does Airbrake integrate with? Q. 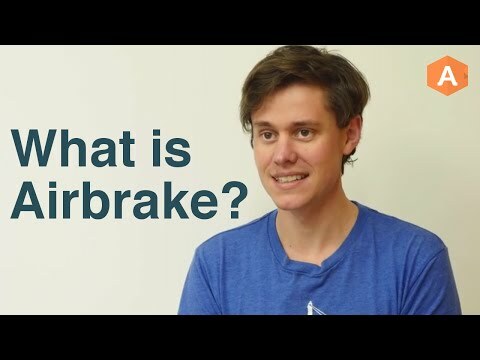 What level of support does Airbrake offer? Q. Which apps is Airbrake compared to most often?